Domaine La Favette is a spacious, restored 19th century house set in its own 4000m² grounds in a tranquil secluded location, with vineyards to the front, and the River Aude to the rear. The house is ideal for exploring the Languedoc region, Cathar Country and visiting the Mediterranean beaches. Large south facing terraces and private pool (10 x 5m approx), with a range of chairs and sunbeds. Most rooms have original oak beams, and tiled floors. All rooms have wooden shutters. Large, comfortably furnished open plan living room with original beams, tiled floor and wood burning stove. Well equipped kitchen including range cooker, dishwasher and microwave, with washing machine, freezer and extra fridge in a separate utility room. Three double bedrooms (two with ensuite shower rooms) and two twin bedrooms, family bathroom, and a wet room downstairs. The house is 2.5km north of Coursan, giving you peace and quiet, and within a short drive or bike ride of all local facilities. Travel to La Favette: Airports: Within 1 hour drive of Beziers, Carcassonne, Perpignan and Montpellier, 2 hours from Barcelona-Gerona, Toulouse and Nimes (airports serviced by Ryanair, EasyJet, Flybe, and British Airways). Flights to Beziers from Bristol and London Luton, from Frankfurt to Carcassonne. Railways: the TGV from Lille (served by Eurostar) takes around 5 hours to Narbonne - car hire is available near the station. Motorail from Paris is also available. Drive: from Calais, it is possible to drive to within 15km entirely on auto route, including the famous Millau viaduct. With breaks, it takes around 8-9 hours (depending on traffic). Furnished with two large settees and occasional tables. This is a large house, in unspoiled rural France, in the heart of wine-making country, in a secluded site surrounded by vineyards. It has been sympathetically restored, retaining tiled floors and oak beams in many rooms. Many of the bedrooms have antique French furniture. There is an interconnecting door on the first floor, which can be closed to create a separate 2 and 3 bedroom suite. There is wifi available and the TV is connected to the internet for UK channels and boxed sets. In the large garage is a table tennis table. The rear gardens with fruit trees (help yourself!) lead to the River Aude. Large south facing terraces run along the front and side of the house, surrounding the private pool, with tables, chairs, sunbeds and parasols, so you can eat (and drink) outdoors in peace and comfort. The pool house has a sound system for ipods, and drinks can be kept cold in the fridge. 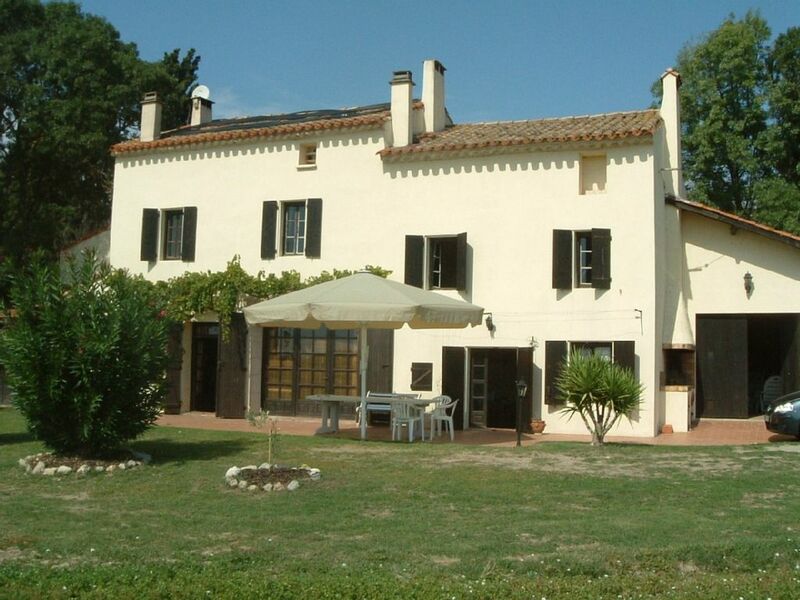 Lovely spacious converted farmhouse by the river Aude surrounded by vineyards. Very quiet rural setting away from any other buildings - ideal if you want peace and quiet. You need a car to get anywhere but well placed for surrounding towns and beaches only 25 mins away. The house had a very French feel to it - this is no modern identikit villa - it has a great charm to it with all the mod cons you need. Lovely large pool which we used just about all the time. Great house, well equipped kitchen, big clean bathrooms, and the swimming pool! Superb ! Property managers Julie and Mark extremely helpful. We stayed in Domaine La Favette for a wonderful two weeks at the end of June, beginning of July. The house was perfect and the photos do not lie. The house was well equipped and had pretty much everything we needed to enjoy our stay. There was loads of space in the house as well as outside. The pool area had plenty of room for sun loungers and chairs as well as a small pool house with a fridge for keeping the drinks cold. The pool, which was a good size, provided a welcome break from some of the really hot days we had. There was a large garage attached to the house with a BBQ, table tennis table and a few bikes. We did manage to get some of the bikes working but they definitely need updating. The house is very quiet and has vineyards one side and the river Aude on the other. We really enjoyed walking along the raised riverbank and watching the local wildlife. We also managed to cycle to the Canal de la Robine which links the Canal de Midi, via Narbonne to the coast. It was an easy cycle along quiet lanes to the canal and then a nice cycle along the footpath. Coursan is only about a 5 minute drive away and although it’s not very big it has a decent Super U with a 24 hour automated petrol station. There’s also a good boulangerie plus a nice wine shop selling wine en vrac. We only tried the Chardonnay but that was very nice. For local restaurant’s we tried Narbonne, which is about 15 minutes away, and Narbonne plage, about 30 minutes away. Both places had plenty of restaurants to choose from. Narbonne plage is great if you want the beach. We went on several day trips. Carcassonne, which is about an hour away, is probably the main attraction. Closer to the house is the Abbaye De Fontfroide, which is worth a visit on a hot day as its nice and cool inside. There are also quite a few hill top villages near the Abbey. Phillip was really helpful whilst we were booking our holiday and Mark and Julie, the local agents were very welcoming with tips and local knowledge about the area. Thank you for your lovely review of La Favette. We are really pleased you enjoyed your stay at the house. We take on board your comments re the bikes and will look to update them for next season. We look forward to welcoming you back in the future. A great house in a very rural location set amongst vineyards. We ( 4 adults and 2 children ( under 10)) had a great week at La Favette. Lots to do in the area be it towns/ villages, historic sites, or just the beach . The kids loved the pool (which was very clean), the local play area and a good quiet stretch of beach which was only 30 minutes away - we had a few visits. In the evening it was nice to walk through the vineyards or along the levee - very relaxing. The house is well appointed and very spacious. Mark is extremely helpful and full of local infomation. Coursan has plenty of shops and a well stocked wine cave. The Chardonnay (well chilled) en vrac is highly recommended. La Favette was a great place for our two-week family get-together, housing ten people with ease. The setting among the vineyards was peaceful and quiet, an ideal place to spend many hours fraternising by the pool. There are lots of interesting places to visit within easy distance, Carcassonne with its walled medieval city, Narbonne has Roman ruins and museum, markets, a wonderful food hall, Cathedral( we were lucky to be able to attend a concert there). Celebrations for Bastille Day included a band and dancing outdoors in the Square. Most of our party enjoyed the 2km walk to Coursan, slightly longer if you take the walk along the levee by the river. Most services are available in Coursan. Mark and Julie were extremely helpful and have a good knowledge of the surrounding area . PS Bicycles need to be updated. We are delighted to hear you had a lovely holiday and enjoyed La Favette as much as we do. We look forward to welcoming you back in the future. La Favette was an ideal house for us- a group of friends. We had a wonderful week of relaxing by the pool, going for walks, eating outside on the terrace and enjoying the weather. We ended up not straying far from the house as the local town had all that we needed to enjoy the holiday. Would love to return to this house as it provided a perfect space for us to enjoy the weather and the peaceful setting. A very memorable and happy holiday for us all!! La Favette is five minutes from the wine producing town of Coursan, with its narrow streets, 17th century church and daily market. Just 10 minutes away is Narbonne with its historical centre, the Cathedral St Just, bustling market, restaurants and cafes and excellent shopping facilities. The extensive sandy Mediterranean beaches of St Pierre sur mer and Narbonne plage are only 15 minutes drive, through the La Clape nature reserve with its many wine producing chateaux. The fairytale medieval center of Carcassonne is 50 minutes drive. The Canal du Midi runs nearby. Ideal center for touring Cathar Country, and the Minervois and Corbieres wine regions, with its many picturesque villages, vineyards and local markets. Agde, Sete, Montpelier and the Haut Languedoc National Park are all within easy reach. You can also visit the African Wildlife Park at Sigean, and even drive to Barcelona (250km distant). There are also many restaurants within a short drive - details are in the house book. Rate includes weekly bedding and towel change, bathrooms/kitchen cleaning, pool cleaning and electricity. A booking deposit of 25% is required to confirm a reservation, balance due 8 weeks prior to arrival date. A damages/cleaning deposit of £350 is also required.